James of Voragine has been beatified by the Church for the sanctity of his life. He lives in secular history for quite a different reason-he was a creative genius of his age. His so-called Golden Legends, which has enjoyed a circulation of nearly seven centuries, is only one of several projects which in his time, as in ours, are a tribute to the versatility of the man and the zeal of a saint. Little is recorder of the childhood of James. He entered the order, in Genoa, and soon was known both for his virtue and for a singularly alert and practical mind. Tradition says that James was the first to translate the Bible into Italian. Whether this is true or not, it is ample evidence that he was a good scholar. 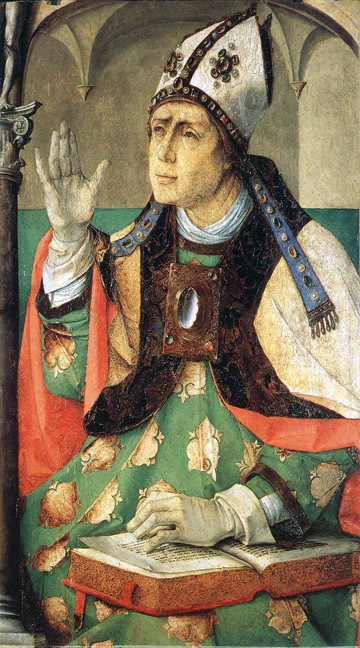 As Prior, provincial, and later Arch-Bishop, James gained a reputation for strict observance, heroic charity, and sound good sense. He was a builder where war had wrecked, a peace maker where others sowed trouble. He must of had a contagious zeal, for the wealthy gave to him as readily as the poor begged from him, and under his hand ruined churches and hospitals were built again, the sick and poor were cared for , and order was restored. He was a genius at getting things done; and , fortunately his whole heart was bent on doing for the glory of God. Like others of his calling and training, James was first of all a preacher. For those many who could not read, one of the chief means of instruction was sermons which took their key note from the feast of the day. The saints, the stories of their live and examples of their virtues , became as much part of a Christians life as the people around him. The collection of stories – later called The Golden Legend – started as a series of sermons prepared by James for the various festival of the saints. Since he preached in Italian, rather than in Latin, his sermons had immense popular appeal, and they were rapidly copied by other preachers into all the languages of Europe. The Golden Legend was , next to the Bible, the most popular book of the middle ages. James was rigorous in his observance of the Dominican Rule, which is of itself enough to canonize him. He had also the good sense to make use of changing trends to further the work of God. Today he would be using the radio, the press, the movies, and television; then he used what his century had to offer- sermons in the vernacular, religious drama, and music. How much present day drama and music owed to him, it would be impossible to say. There is an amusing story told of his efforts to fight fire with fire. He organized a troop of jugglers and acrobats from the student novices of San Eustorgio, in Milan, who were to mingle entertainment with doctrine in an effort to combat the indecency of the secular theater. This was one scheme which left no lasting effect on the order, but it does serve to show that James was a man of his times, alert to the changing needs of a fast moving world, and whole heartedly determined to win the world to the truth of the One Holy Catholic Faith by any honest means that came to hand. Purity, poverty and charity were the outstanding virtues of this man whom the Church has seemed fit to enroll among Her blesseds. He will always be recognized in Dominican history as a man of many and peculiar gifts, who consecrated his talents to God, and, in trading with them , gained heaven.